Thanks to Kalle Marjola for responding to our interview request to talk about his games Knights and Fantasy Forces. You seem to have a very strong interest in RPG as well as computers - how did the two interests combine? As (fantasy) RPGs were big thing then weapons, traps and monsters from those appeared in games, and vice verse. 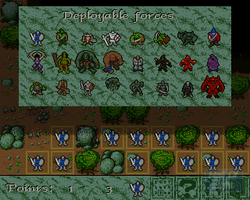 Naturally related games like Warhammer also had its part, especially in my other gaming projects like Fantasy Forces. 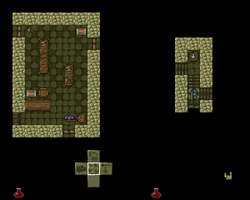 Are there any RPG you wish you had converted into a computer game? Not really. I thought that they were different in that sense that in RPG you can do whatever you want and that is the reason to play them - when converted into a computer game, you lose that. How did you become involved in programming on the Amiga? As I have always been a creative person that was natural progress after programming on the C-64 earlier. Your website appears to lists 3 Amiga games which you developed, Knights, Amiga Fantasy Forces and the unreleased Factor! Are these all the Amiga games you made and are you prepared to release Factor! as public domain? There was other projects, too, like one "Scorched Earth" clone "which fixed everything done badly in SE" - that was very playable but well.. the finishing touches were left out. Miku is credited with the music on Kights - is this an area of computer game development which did not appeal to you as much as programming? Well I tried to make music several times but really failed at that.. and had no suitable HW anyway. 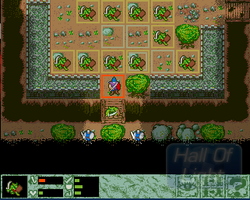 Fantasy Force seems similar to Amiga games such as Laser Squad - which computer games or RPG games inspired you during the time you were programming on the Amiga? You stated that there is a C-version of Amiga Fantasy Forces which accepts up to 5 players, has 3 new creatures and runs faster, with longer sighting range, too. 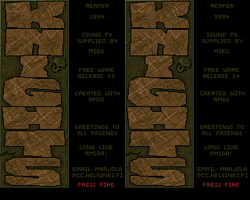 Are you willing to make this available to the Amiga community? It did not have double-buffering and had some bugs so I never felt it ready enough to release..
Knights was included at number 10 on Cody Jarret's top 20 Amiga Shareware games on the EAB Amiga Forum - Are you surprised the game is so highly regarded by the Amiga community? Well it definitely had its followers - I received email and regular mail about it for many years and now and then hear from people I meet that they played it a lot back in 90s, so I knew it was popular but had no idea how did it compare to other free games. 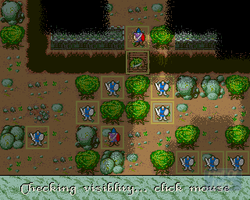 Knights and Fantasy Forces were both created with AMOS - how easy was AMOS to use as a programming tool? What were the biggest challenges you faced when creating Knights and Fantasy Forces and which one did you enjoy making the most? In Knights, I found out that it was just too slow machine to proper moving algorithms for zombies, so I cheated and they "teleport" from room to room when no one is seeing. In Fantasy Forces, the problem was doing the LOS code in acceptable speed. 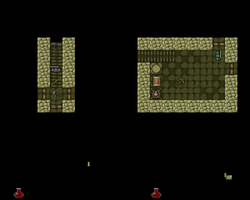 I think I enjoyed most the creation of random dungeons and seeing how well the zombies worked after all. Screen shot taken from Lemon Amiga Website. 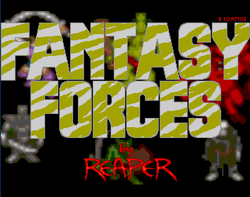 Did you always know Fantasy Forces would be your last Amiga game or were there other projects you considered for the Amiga? Did the shareware model work or were financial contributions from gamers disappointing? Was the Amiga press supportive of your games - do you recall any of them being reviewed? Are you still involved in the computer industry today and if so are there any projects that you would like to share with our readers? Yes I am software developer nowadays, and as hobby I have started many gaming projects but as those are bigger and bigger productions nowadays, nothing ready - creating board/card games is so much easier. I have also programmed a bit to Gameboy Advance (we had a company for a while), but it yet again only reached demo stage. Amigapd would like to thank Kalle for answering these questions and supporting Amigapd. To find out more about Kalle and his latest work visit his website.